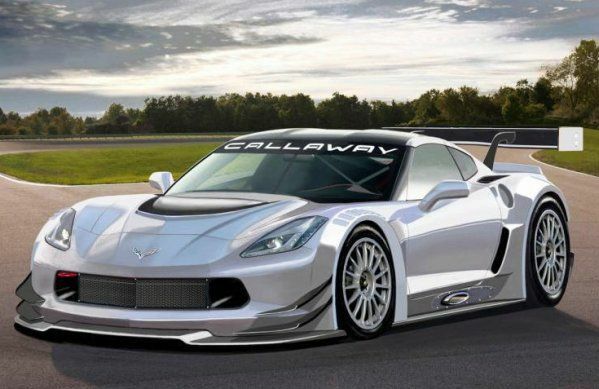 The people at Callaway Competition have received approval from General Motors to begin working on a new2014 Chevrolet Corvette Stingray racecar and the images here are the first rendering from Callaway of what the first C7 Stingray racecar could look like when it arrives later this year. Leingarten Germany-based Callaway Competition has been building racecars based on the Chevrolet Corvette Z06 since 2006 and their Z06-R GT3 has become one of the most successful cars in the Federation Internationale de l'Automobile (FIA) GT3 class in a variety of racing leagues around the world. Based on that success, Callaway has been named by General Motors as the company who will be responsible for the FIA GT3 homologation process behind design, engineering and approval process of the first C7 Corvette racecar. The fact that Callaway will seemingly base their C7 Corvette racecar on the “base” Stingray as opposed to the higher end Corvette Z06 used for their C6 racecar speaks volumes of how good the 2014 Corvette really is. This news of a C7 Corvette FIA GT3 racer comes close on the heels of the news that the Chrysler Group was designing a GT3 version of their 2014 SRT Viper. The Corvette and Viper have both become supercars that can compete on the global level while still going toe to toe for the bragging rights of being the top sports car in America. The new SRT Viper has already been battling the C6R racecars in the American LeMans Series (with the Corvettes getting the better of the battles thus far) but the ALMS Corvette teams rely on the supercharged Corvette ZR1. It will be interesting to see how Callaway’s GT3 Corvette Stingray racecar competes with the Viper on the European racing scene while also doing battle with the likes of the Mercedes Benz SLS AMG, the Ferrari 458 Italia, the Lamborghini Gallardo, and the Audi R8 LMS. The 2014 Chevrolet Corvette Stingray in both coupe and convertible form was designed to be a sports car sold on the global level. Success on popular European racing schedules like the FIA GT3 can help bolster sales in those non-domestic markets and even though the Corvette is already very well known around the world – being a racing champion can give a “foreign” car like the European-sold Corvette a stronger foothold against those domestic competitors. Based on these first two images of the Callaway C7 Corvette GT3 racecar, it looks like the FIA-bound racer will maintain as many physical design attributes as the production street cars. This includes the large lower fascia opening, the sharply angled headlights and the vented hood up front with the controversial taillights and the same general silhouette as the production car – with huge fender flares, a massive rear spoiler, an elaborate lower rear diffuser, an intricate front diffuser system and race ready rims and tires... of course. There is no question that the C7 Corvette looks every bit as awesome as a racecar as it does as a mere production road car. We can pretty much expect that the Callaway Competition-designed 2014 Chevrolet Corvette Stingray GT3 racecar will continue the successful legacy that was started by the C6 Z06 R race program but it wont come without a fight as the new C7 Stingray racecar will have to take on – and take down – some of the most well respected street cars-turned-racecars in the world.